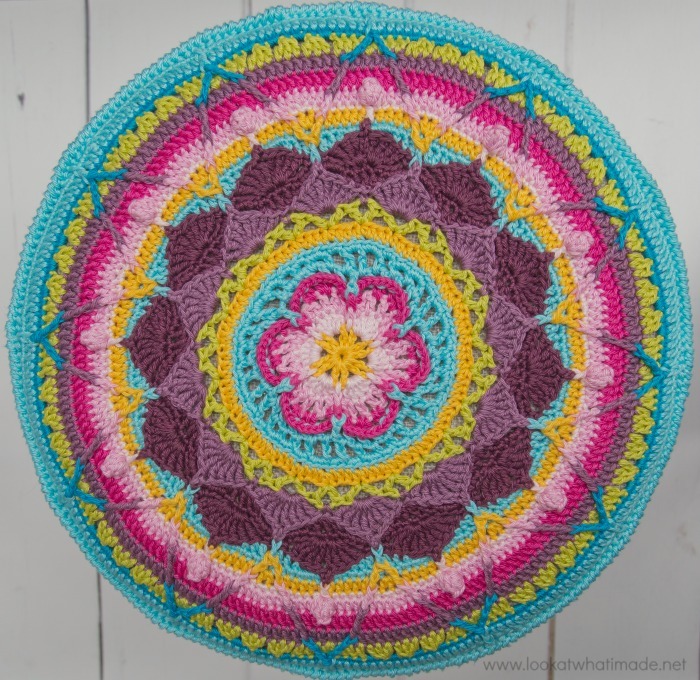 When Scheepjes asked me if I would like to design a stool cover, I immediately thought of using Sophie’s Mandala, which is the centre of Sophie’s Universe. I decided to keep the sides and socks plain so that they would complement the top, not fight with it. I also wanted a sturdy fabric that would hug the stool well. Linen stitch has always been one of my favourite ‘plain’ stitches. It is quick and easy to make, but it doesn’t look boring – especially when each round is done in a different colour. The cover and socks are made in Catona, which is 100% mercerized cotton (sturdiness again). I chose the same shades as those used in the Cotton 8 version of Sophie. Each stitch of this project was a joy to make. I think I smiled more working on this than I have in the past year – and I have smiled (and laughed) A LOT this year. The Sophie pattern in all its guises has become a companion and trusted friend. I cannot imagine the day when working it up will no longer bring me joy. We wanted a way to celebrate this joy, so when it came to choosing an inscription for the buttons, what better than ‘Live, Love, Laugh’? Please note that the kits do NOT contain a printed version of the pattern. 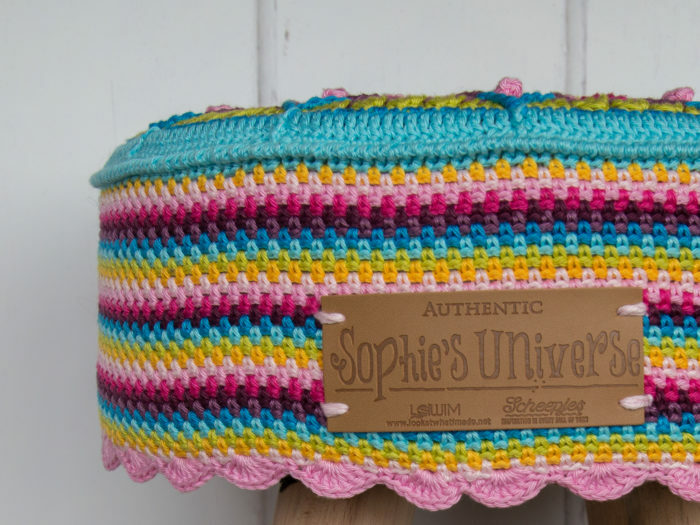 You will find the pattern below under ‘Sophie’s Stool Pattern‘. Please Note: Due to the size and weight of the kits, most UK sellers will NOT be shipping internationally. I love the way the promotional material matches the look of the Sophie Book! © Dedri Uys and Scheepjes 2017. All Rights Reserved. * An asterisk indicates pattern repeats. You will need to repeat all the instructions between asterisks the number of times specified. This is a hard-core repeat and will consist of multiple instructions. Parentheses () indicate repeats. You will need to repeat the instructions between parentheses the number of times specified. This is a lower level repeat. Parentheses are also used to indicate a group of stitches to be worked into the same stitch/space. Please check your gauge! You might find that you crochet looser than me (most people do), in which case you will need to go down a hook size (or maybe even two). 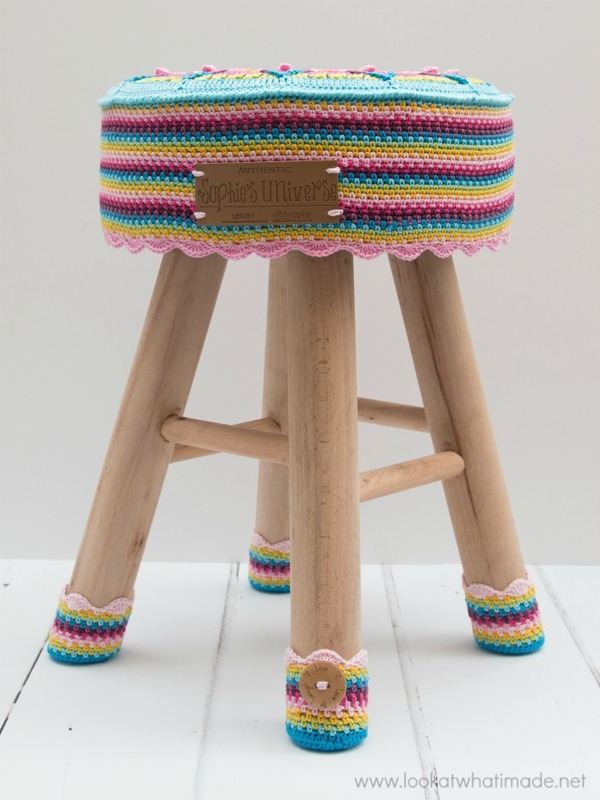 When you have completed your stool cover and socks, you want them to fit quite snuggly over your stool and stool legs. It should be a bit tricky to get the socks onto the legs. If they slip on easily, they can slip off again just as easily. At the end of Part 1, your circle should measure 10 cm across. 30 cm (11.8”) in diameter, 10 cm (4”) high. *Cover Coming Out Too Big? If you think that your cover will be too big, even though you have tried to match tension, please see ‘Making Your Cover Smaller‘ at the bottom of this post. The sides are made with a larger hook. The socks should measure 5 cm at the end of Round 4. This is important! Measure them against the base of the stool leg. They should be the tiniest bit bigger than the base. 5 cm (2”) in diameter, 5.5 cm (just over 2”) high. Sew the label to the side of your stool cover, lining the bottom of the label up with Round 26. Sew the buttons onto the socks, lining them up with one of the Scallops. I sewed mine to Round 14 of the socks. Depending on your personal style of crocheting (throwing/picking and yanking/lifting/riding), you might find it hard to obtain or maintain gauge, even if you do go down a hook size or two. If you find your cover coming out too big, don’t worry. All is not lost. You can still make it fit. Before you make Round 23, measure your ‘Top’ against your stool. 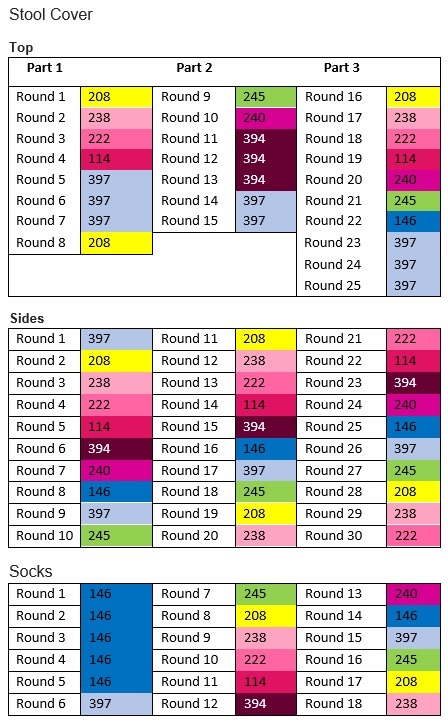 Continue on to Round 25 (Crab Stitch Round), skipping the first FPdtr of each FPdtr pair in Round 22 for a total of 228 sts. Continue the pattern as written, still using the same hook. Complete Round 23 for a total of 228 sts. You might find it necessary to use hdc instead of dc. Continue on to Round 25 (Crab Stitch Round) for a total of 228 sts. Continue the pattern as written. But What About My SOCKS?! Frog Round 4 (I know!) and re-make it in sc instead of hdc for a total of 40 sc. It is ok if they are still slightly too big at this point. If they are absolutely ginormous, you might have to re-make both Rounds 3 AND 4 in sc instead of hdc. Complete Round 5 as written. Complete Round 6 (and the remainder of the rounds) WITHOUT changing hook sizes! I hope you are as excited about this project as I am! 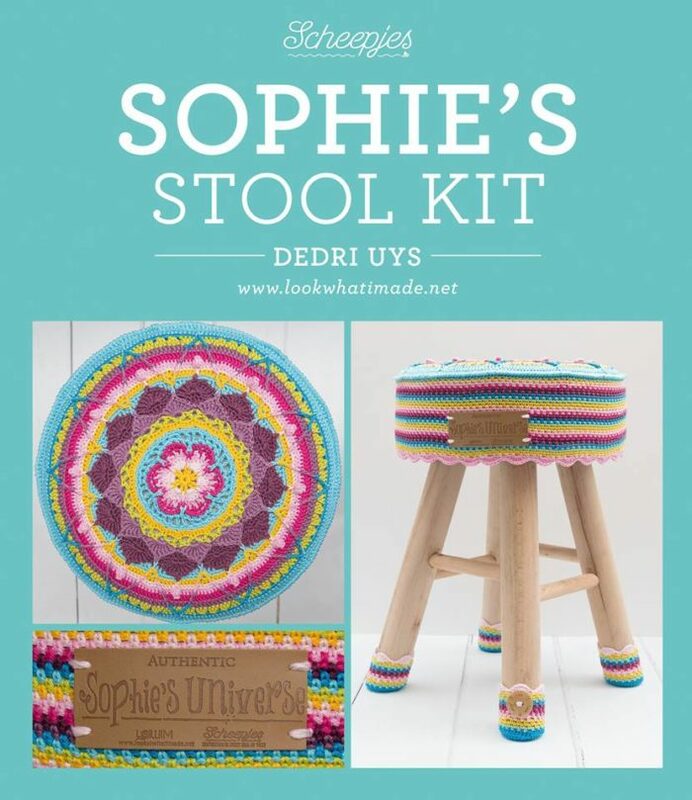 If you make Sophie’s Stool, I would love it if you would share photos using #sophiestool so that I can see them. Hi just making Sophie’s stool. Instead of using 3.00mm hook I used a 2.5mm hook and the tension was perfect. I am now going to start the sides. Even thou I dropped a hook size am I best dropping a hook size for the sides to a 3.00mm hook even thou it states a 3.25mm hook. Just don’t know what to do. Hi Loraine. 3mm hook will be perfect for the sides. Please ignore my last question. I worked it out and did the optional round and I am so glad asked it looks good. Hi. I am making the stool and I just wanted to clarify something. The information above says make parts 1-3 including the optional round 25 but the pattern for the sides say crochet into the stitches of round 24. Should it say NOT including round 25? I am doing ok with gauge but have done sc instead of dc for round 23 to make it a better fit. Fab pattern. Thank you. Thank you so much for sharing this pattern and selling kits make me easer! Your instruction was very easy to follow even I’m still beginner. I was using 2.75mm hook lol So I re did but was still 2cm larger than yours and I had no idea how I can fix it anymore so I made adjustment in last few round with sc. Also socks for legs were 30 stitches instead 40. By the way, I’m wondering that if there any 2nd print come up for the book for blanket? I checked with Amazon and sold out but used was doubled price. Thank you for the opportunity to learn some thing new! Hi Chiharu. Thank you for your message and your feedback. Occasionally people crochet so loosely that not even going down hook sizes makes enough of a difference. I’m glad you managed to tweak it to work in the end. I will have a look on Instagram to see if I can see your stool. There are loads of prints available, so I am not sure why it says sold out. Can you have a look on Amazon.com? They have them back in stock. Firstly I would like to say how talented you are and how much I love your patterns and kits! I was just wondering the metal ring to comes extra with the stool kit will that pattern be released soon? Hi Lea. Thank you. I am not sure which metal ring and pattern you are talking about. Could you clarify? Hi. I’m hoping to make the stool cover and want to make sure I have all the correct tools. You suggest some people may have to go down a hook size. Can you specify hook sizes? For example, when you say go down 1 hook size from a 3mm does that mean use a 2mm? Or a 2.75mm? Sorry to be so pedantic. I understand this is difficult to answer exactly as we all have a different tension so it will depend on my gauge but I dont have any hooks between my 2mm and 3mm so am just wondering what else i might need to buy just in case. I dont want to be stuvk without something once i jave started. I hope this makes sense. Thanks in advance for any tips or advice you can offer. Hi Jodi. I mean that you might have to go down to a 2.75. One lady has had to go down to a 1.25, though, so it really does depend on your personal tension. If you would like me to look at your tension and give you a more accurate answer, I will need to see a few close-up photos of your work. That will help me suggest a reasonable substitute hook. You can send me photos at dedri(at)lookatwhatimade.net. Im having a lot of difficulty with sizing. In the end my hubby has padded my stool to make it big enough. Just started the socks and after going down to a 2.75 hook after 5 rounds measured 7cm. I have done numerous attempts with smaller hooks. Im now trying a 1.5mm hook. Has anyone else had my problems. Hi Julie. I am sorry to hear that you are struggling so much with sizing. It sounds like your tension is much looser than mine. May I ask how you hold your yarn and hook? Do you hold your hook and your yarn in the same hand or do you hold your hook in one hand and ‘tension’ your yarn with the other hand? Do you throw your yarn like a knitter, or do you pick it in the more traditional way? I know these questions seem odd, but it will help me understand how to better answer you in your specific situation. I have seen a couple of covers that have come out bigger, but for the majority, going down a hook size when this is the case has fixed it. I look forward to hearing back from you so that we can figure this out. Hi Zohra. 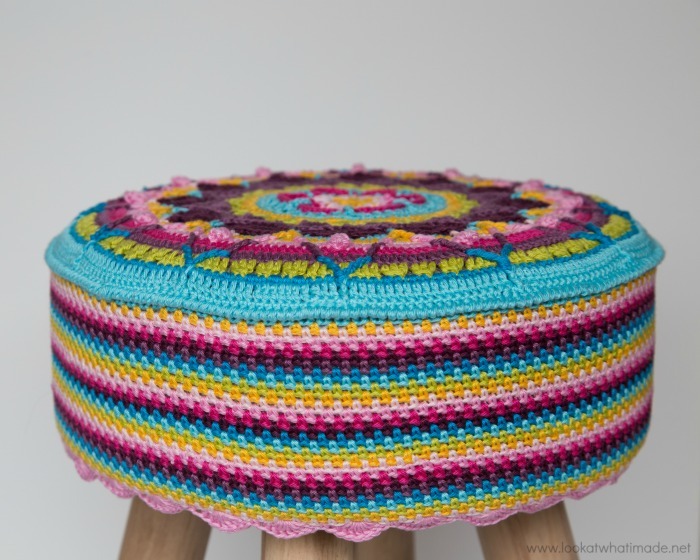 No, we don’t have a video tutorial for the stool cover itself, but there is a video tutorial for each of the 3 parts of Sophie’s Universe that form the top. If you click on the links to each part, you will find the link to that specific video tutorial under ‘Helpful Resources’. Trying to get Sophie’s stool pattern, why not in with kit?, have bought kit no idea what to do next, Is this going to be a waste of money, such a lovely project too, please help with pattern & instructions. Hi Joyce. 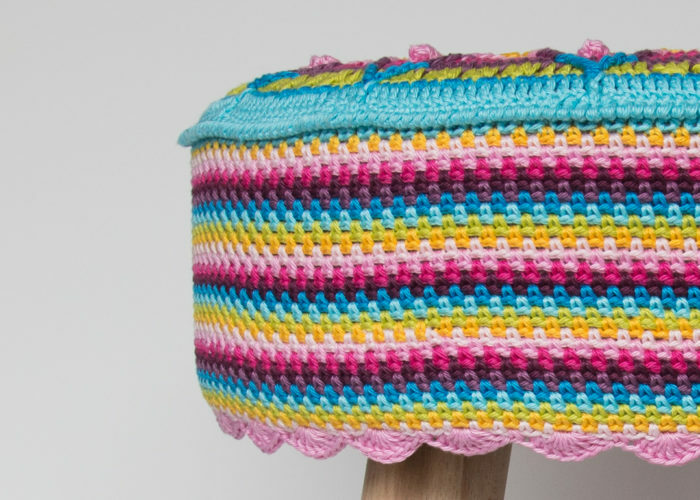 The pattern for the top of the stool cover has been available for free here on my site for almost 3 years. As the pattern is free and a lot of people either already have it or have access to it, we decided to keep the cost of the kit down by not including it. If you scroll down in this post a bit, you will find the instructions for making the stool cover, with links to the parts needed for the top and the video tutorials for those parts. The community that has developed around Sophie is a caring and generous one. I hope that you will enjoy joining us. If you are still unhappy with your purchase, you are welcome to return it to the shop you bought it from and they will refund you. Just received my Sophie Stool for Christmas. Can’t wait yo get going. However, my family will complain if I don’t cook the Christmas dinner! Thank you Dedri for such an inspirational patterns. Wishing you and your family have a lovely Christmas. Joy, have you tried using a smaller hook size? This may help a bit. Just finished the crab stitch row. Now need the apple!!! Thoroughly enjoying the stool project. Now for the sides and little socks. Will go beautifully with my Sophie Blanket that I made when you first did the CAL. Hoping to finish it soon as I want it to be “show and tell” at my Christmas Craft Group. Thankyou Dedri for your wonderful patterns and instructions. 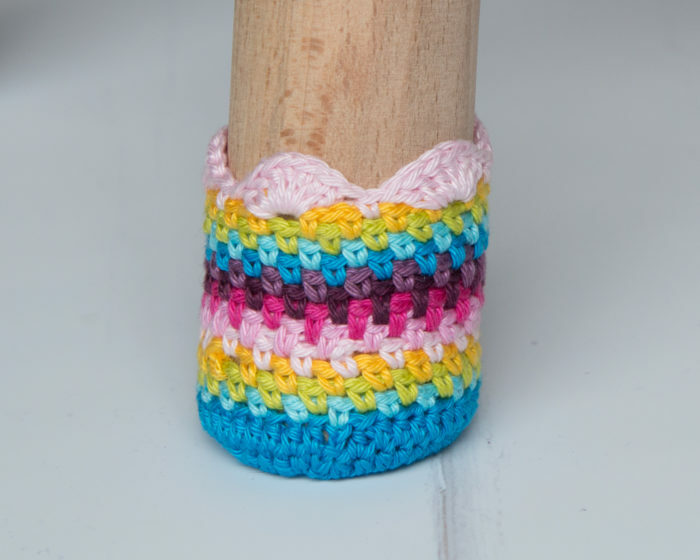 Just a question about the crochet hook sizes: the Materials list has 3.00mm and 2.50mm crochet hooks, but the Pattern mentions 3.00mm and 3.25mm hooks. Is the larger 3.25mm hook the right one, rather than the smaller 2.50mm one? Jan! That was a typo. Thank you for asking your question otherwise I might not have seen it before it was too late to avoid a mobbing! The 3mm hook is for the top of the stool cover and the bottom of the socks, the 3.25mm hook (slightly larger) is for the sides of both. Linen stitch has a tendency to ‘pull in’, so it requires a slightly larger hook when married with other stitches. Wool Warehouse have stock now, and so does Black Sheep Wools (links in post). Sadly stool kit is too expensive in freight to Australia. Would it be possible to have kits made without stool? Hi Narelle. I did inquire, but unfortunately, the kits will only be available WITH the stool. I’m hoping an Australian supplier will pop up soon. Hi Dedri, Do you know if the ‘Sophie’s Stool Kit will be available without the stool for those not living in the U. K. ? It would be a shame to exclude the rest of the world from obtaining the authentic Label and buttons along with the yarn. The stool kit will be available to people in Europe and the UK at present and should also be available in the US eventually. This is so cute. I wish I had a use for a stool now. You are addictive. I just LOVE that little stool and the wonderful crochet, especially the little crocheted socks!! !